The family of Lee Rigby said that "justice has been served" today after one of his killers was told he will die behind bars and the other would serve a minimum of 45 years in prison. There were dramatic scenes at the Old Bailey as Michael Adebolajo - who was handed a whole life term - and Michael Adebowale reacted angrily to comments Mr Justice Sweeney made about their extremist beliefs during the sentencing hearing. Mr Justice Sweeney told them: "You each converted to Islam some years ago. Thereafter you were radicalised and each became an extremist, espousing views which, as has been said elsewhere, are a betrayal of Islam." 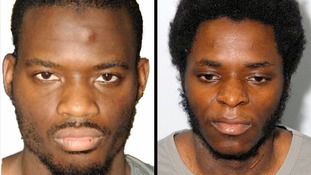 Adebowale - who was handed a minimum 45-year term - protested that this was a lie, ranting about America and Britain, and his accomplice joined in, screaming "allahu akbar" and hurling abuse at the prison guards who grappled him to the ground. Both men were grabbed around the face as guards struggled to control them, and taken down to the cells. Lee Rigby's family were visibly distressed, and one relative needed medical treatment following the disturbance. As a result, Mr Justice Sweeney sentenced the men in their absence. In a statement read by family liaison officer Detective Inspector Pete Sparks outside of court, the soldier's family said: "We would like to thank the judge and the courts for handing down what we believe to be the right prison terms. "We would also like to thank everyone who has supported us in the last nine months. "It has brought us a lot of comfort and we feel satisfied that justice has been served for Lee. We now ask to continue to grieve in private." The British-born extremists mowed Fusilier Rigby down in a car before hacking him to death in the street in front of horrified onlookers near Woolwich Barracks in south east London in May last year. They both claimed that they were "soldiers of Allah" and were motivated by the plight of Muslims abroad to carry out the killing, and have shown no remorse. There was also dramatic scenes outside of the court today, as far-right protesters gathered ahead of the sentencing. Three people were arrested by police.